In November, Whitesnake will release a new album - a live album. Your first thought is probably the same as mine - Why? 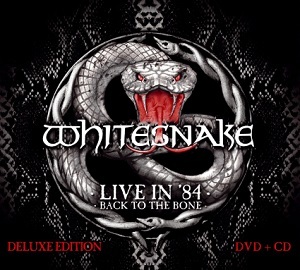 The last two Whitesnake releases have been live albums ("Made in Japan" and "Made in Britain/The world record"), so it's odd to get a third live album released with no studio album in sight. Where this new album differs significantly from the last two live albums is that this isn't a recording of the lineup that played on the last tour - instead this dates back to 1984 and a lineup that included Cozy Powell, Jon Lord and Mel Galley, all of whom have sadly passed away since then. Alongside them were John Sykes, Neil Murray and of course David Coverdale. It's 30 years since the release of the Whitesnake album "Slide it in", and this new live album was recorded on the tour that followed the release of "Slide it in"
The new release is available as a DVD or as a CD/DVD. The CD is described as "Best of the bootlegs", and was taken from various dates on the world tour. This does explain the slightly strange track listing - "Ready an' willing" for instance appears twice (three times if you include the medley). The DVD was recorded at the first Japanese rock festival at Seibu Stadium in Tokyo - a show that was Jon Lord's final performance with the band. If you're going to buy a Whitesnake live album, an album featuring a classic lineup like this one has to be a strong contender for the best choice. The sound quality on the CD is very good - they've done a great job on taking the old recordings and getting the quality up to scratch for release. The music is great - so many talented musicians in one band, and with David Coverdale's voice sounding fantastic, this really is a pleasure to listen to. The Hammond organ played by Jon Lord really is distinctive and adds so much to the music. Throw in the great guitar, drums and bass and the superb vocals from David Coverdale and it's hard to think how it could get any better as a live album. While your initial thought may be "Oh no, not another live album", once you read the details you'll realise that while it is another live album, it's not your average live album - this is a live album that captures a classic lineup at their best. It's an essential purchase for any Whitesnake fan.